With HomeKit-compatible accessories finally hitting the market, Apple has added new capabilities to its home automation platform in iOS 9 to make smart bulbs, locks, and garage door openers easier to manage and more powerful— including the ability to define IFTTT-style event chains with new Event Triggers. If there's one thing about the smart home revolution that most consumers can agree on, it's that we want our homes to be better at thinking for themselves. It's the twenty-first century; why should we have to fumble around in the dark for a switch because we forgot to leave a light on when we went out for dinner? Tony Stark had the right idea. We've tried to solve these problems in many ways. The Clapper. Motion-sensitive fixtures. Philips Hue. Unfortunately, these all have problems. The Clapper is just ridiculous, and motion-sensitive lights have no contextual awareness. Smart bulbs are better, but they still can't talk to the rest of your house without some third-party trickery. This is what Apple wants to solve with HomeKit, and it's taking a step forward with Event Triggers. 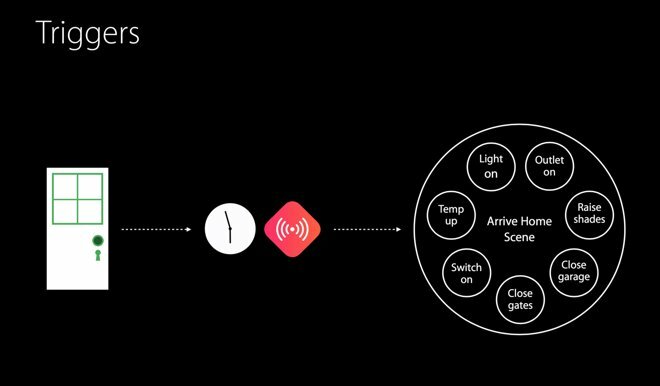 HomeKit's initial release brought scenes —quick ways to set a bunch of parameters for different smart devices at the same time. A "come home" scene might turn on the lights in your hallway and lower the thermostat, for instance. How does your house know that you've come home? Right now, it doesn't— unless you have the perfect combination of equipment that can all communicate with each other through a service like IFTTT. So instead, you whip out your iPhone while you're in the garage and tap "I'm home." With Event Triggers in iOS 9, you don't have to. Any HomeKit device that can be added to a scene can be triggered by events from another HomeKit device, with no external service required. Event Triggers can also be fired by geofences, and conditioned upon the time of day or the status of a specific HomeKit accessory. That means you'll be able to fire the "come home" scene when the garage door opens. Or automatically turn on the lights in your master bathroom when you walk into your bedroom at night, but leave them off during the day. Or open the blinds in your bedroom at 7 a.m. if you haven't moved yet. Good morning, Mr. Stark.